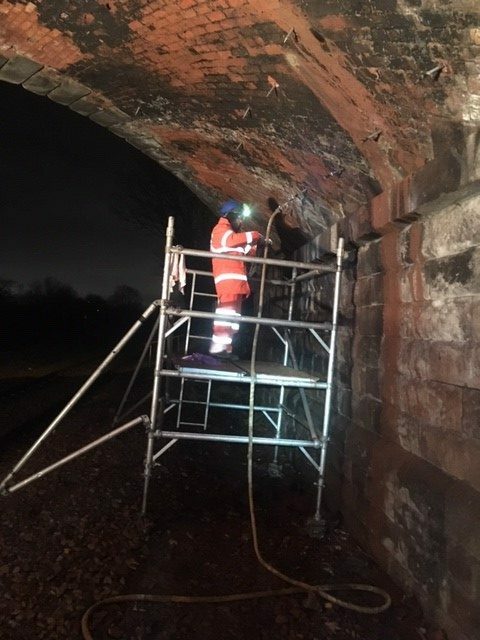 Work has been progressing steadily at Alfreton Rd Bridge. The bulk of the grouting works were completed throughout December, working nights to minimise traffic disruption. Due to the short working, hours all plant and equipment had to be trailer mounted so it could be moved into position when the road was closed at 11pm each evening and again moved off by 5am. 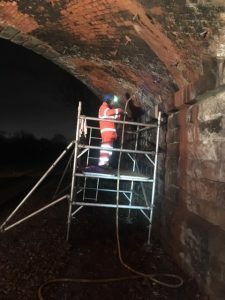 Access to the underside of the Bridge has been directed by Network rail under COSS supervision with nightly possessions. The grout injected into the Bridge arches has been Lime heritage grout. This has been injected through a series of drilled holes at low pressure to replace the backing material over each arch.